Surfing Vowels continues the strategies and philosophy of the Surfing Sounds Dictionary. It reinforces a process for working through a vowel sound and suggests a few new strategies more pertinent to the more focused study and understanding of vowels. There are 20 vowel sounds covered in this resource, plus a page for the schwa sound. There are four parts to the resource: 1) an in-depth introduction to the package, which covers the philosophical framework of all the Surfing Sounds resources; 2) a basic set of four pages for each vowel sound; 3) extra pages for individual vowel sounds; 4) extra pages and activities that have generic value for all vowels; 5) a book of word lists, nonsense word lists, and vowel sound loaded sentences and stories. 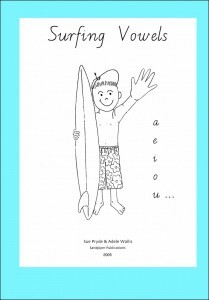 The basic four pages for each vowel include a similar double page layout as for the Surfing Sound Dictionary plus two pages for writing extra words and sentences. As with all of the resources in this series, pages are clear and able to be photocopied as black-line masters. The resource works well for students in Years 2 and 3, as well as for intervention with students who are experiencing difficulties acquiring basic literacy skills.